Patience and persistence pay off! The Yellow Sea coast of the Korean peninsula is one of the few places where this Spoon-billed Sandpiper can still be found. 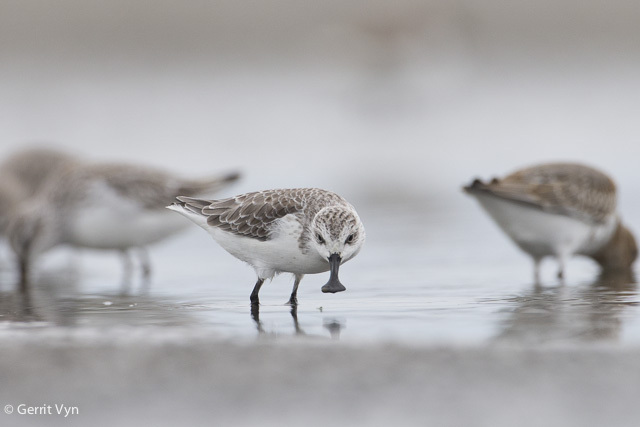 BirdNote’s Adam Sedgley joined Gerrit Vyn, Cornell Lab of Ornithology multimedia producer, to photograph and record these critically endangered shorebirds. They found the sandpipers resting and feeding enroute from their nesting grounds in Siberia to their wintering habitat in Southeast Asia. “During peak migrations in the spring and fall, a single mudflat on the Yellow Sea can have flocks of tens of thousands of shorebirds of different species. When you’re tasked with finding a single species that has a global population of only a few hundred birds, the challenge is like finding a very rare needle in a feathery, and constantly moving, haystack. A couple hours before high tide, Gerrit would set up a camouflage tent near the high water mark and wait for the water to gradually push the birds up the beach. I had a spotting scope in the grass behind him and was constantly scanning the incoming flocks of shorebirds to find a ‘spoony.’ I’d use a radio to communicate the movement of the birds to Gerrit. Bird sounds provided by The Macaulay Library of Natural Sounds at the Cornell Lab of Ornithology, Ithaca, New York. Mixed flock of shorebirds [uned.] recorded by A. Sedgley; call of Spoon-billed Sandpiper [uned.] recorded by G. Vyn.